Journal of Applied Agricultural Science and Technology (JAAST) is published by Politeknik Pertanian Negeri Payakumbuh. 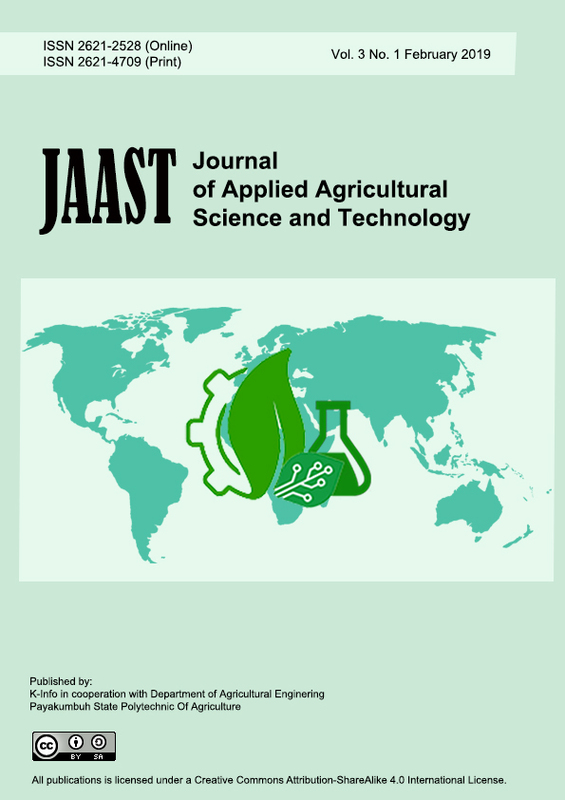 This Journal focuses on Applied Agricultural Science And Applied Agricultural Technology in particular Crop Production, Crop Protection, Food Sciences, Food Technology, Agricultural Economics, Agricultural Statistics, Bioinformatics, Agricultural Mechanization, Farm Structure, Farm Power, Machinery, Irrigation and Drainage, Land and Water Resources Engineering, Renewable Energy, Environment and Agricultural Information Technology. JAAST has been ACCREDITED by the Ministry of Research, Technology and Higher Education (RistekDikti) of The Republic of Indonesia as an achievement for the peer-reviewed journal. The recognition published in Director Decree No. 10/E/KPT/2019 April 4, 2019, effective 2017 until 2022. The journal follows the open access policy that allows the published articles freely available online without any subscription. The Journal is published twice per year in February and August. Articles are written in English.